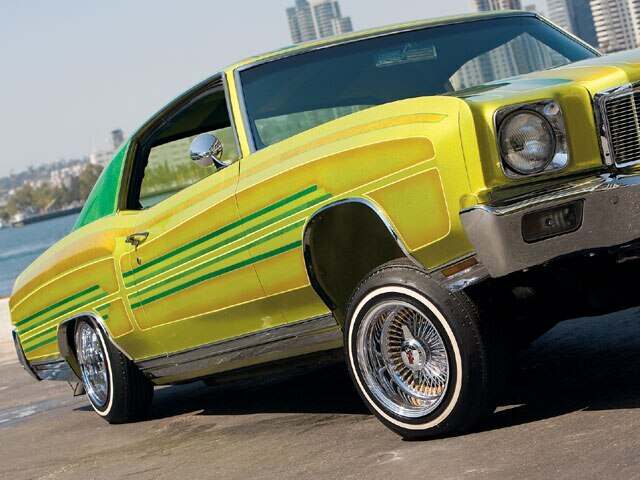 It's No Contest That Eric's Candy Monte Found Its Way Into Lowrider. 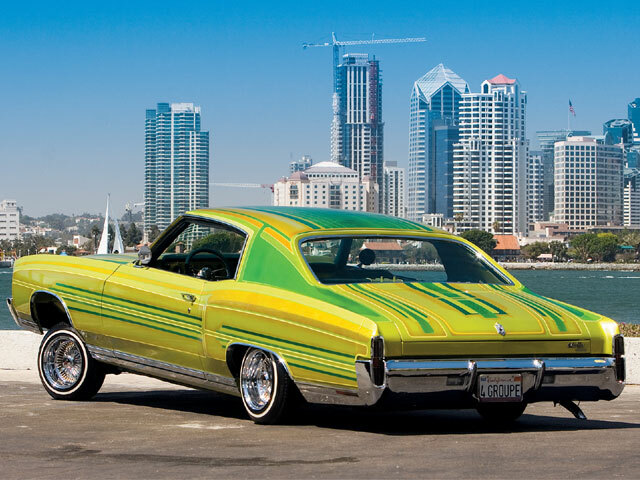 As Eric Gomez of San Diego, California, discovered, there’s more than one way to get your car featured in Lowrider Magazine. Most of the feature vehicles that you see in the magazine were learned about through the “grapevine,” or are Sweepstakes winners at our Tour events, but we know that there are many more cars out there across this great country worthy of the honor that we have no way of knowing about. Eric’s wife and daughter found a way into our pages. Unbeknownst to Eric, Mrs. Gomez decided to send in a photo of Eric’s candy lime green ’71 Chevy Monte Carlo with daughter Sabrina posing next to it for our Mailbox section. Eric’s a proud member of Groupe C.C. 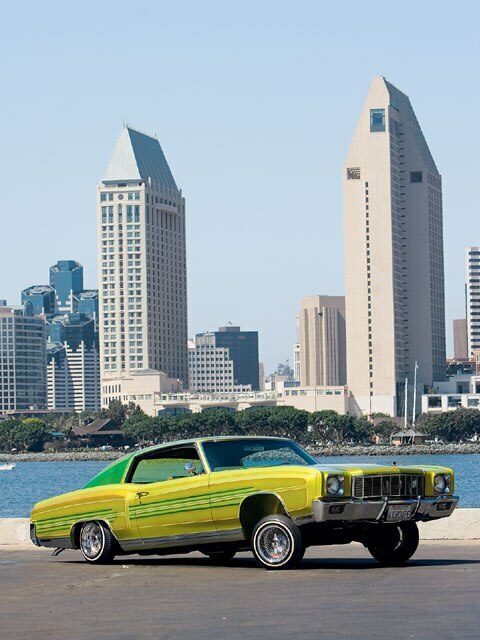 of San Diego and his Monte, “Producto Mexicano,” is one of the chapter’s finer rides, so when his fellow Groupe guys saw the car in the January ’07 Mailbox, they began a little good-natured teasing of Eric. Now there are all kinds of reader rides in Mailbox and it remains one of the most popular sections in the magazine with new pictures arriving at the Lowrider office daily. 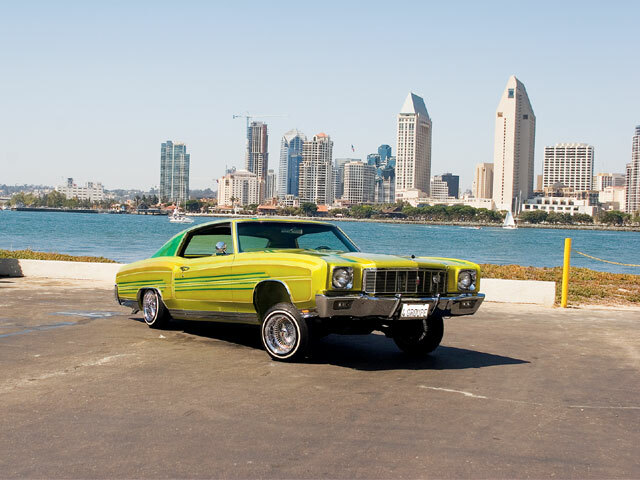 The great number of lowrider-style vehicles out there attests to the strength of the Movement, and, as you might expect, the range of vehicles, both in terms of quality and type, varies greatly (though they’re all beautiful to their owners, we’re sure). So when our esteemed Editorial panel of automotive judges (primarily Editor Joe Ray) convened in a top priority session to determine which of this year’s crop of Mailbox arrivals would be crowned as our second “Mailbox Contest Winner” and earn a full feature as a prize, the decision ultimately came down to a select few cars. 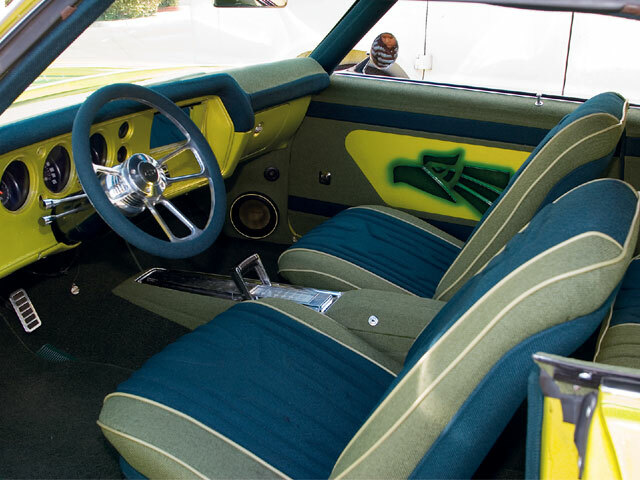 There was some mention of Doug Smith’s ’63 Ford Galaxie out of New York (July Mailbox) along with a few other fine-looking vehicles, but Joe Ray ultimately decided to go with that candy green Monte that he remembered from the January issue. Hey, Joe Ray knows a quality lowrider when he sees one. When we contacted Eric, he told us the story of how his well-meaning wife and daughter had sent in the photo without his knowledge and the clowning that he’d received from his friends in Groupe C.C. since it had been published. At first, he wasn’t sure if he wanted to go along with the idea of being “Ruler of the Readers’ Rides,” especially since he still plans to “complete the car with an undercarriage in chrome and candy,” but then he realized that this was his ticket to magazine immortality and couldn’t pass up the opportunity. We’re happy to present Eric’s ’71 Monte as the 2007 Mailbox Contest Winner, and judging by the quality of this car, as well as last year’s winner, Derek Villar’s beautiful black ’63 Chevy Impala convertible out of Florida, the bar’s been set high for future contest winners. As for Eric, we hope that he gives his wife and daughter a nice hug for “surprising him,” and, as for his friends, we hope that Eric enjoys having the last laugh. Producto MexicanoOwner: Eric GomezVehicle: ’71 Chevrolet Monte CarloCity/State: San Diego, CaliforniaClub: Groupe C.C. Engine/Drivetrain: The stock 350-c.i.d. 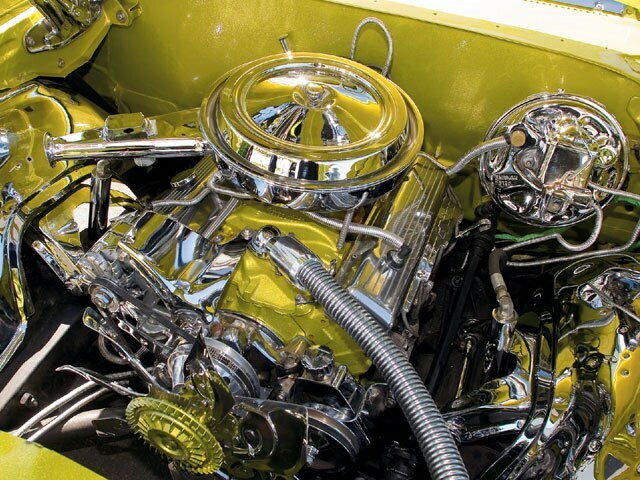 engine was cleaned up and chromed out by Eric’s friend Marcos Santiesteban at his place in National City, California. 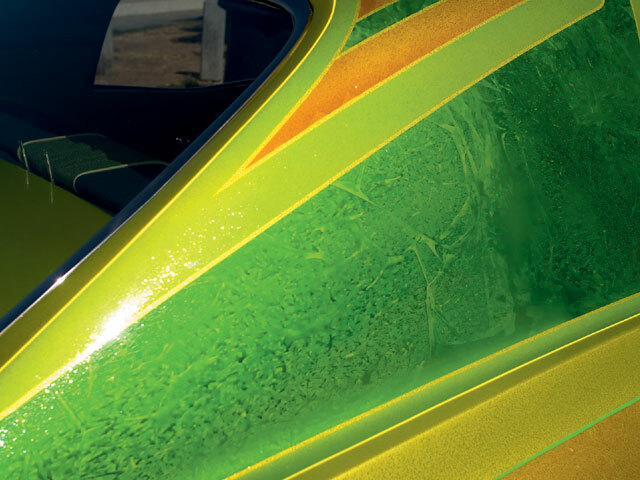 Body/Paint: Another Groupe member, Arturo Contreras of San Diego, performed body mods like shaving the firewall before applying candy lime green paint with graphics and striping. Interior: “Flaco” at Flaco’s Customs in Chula Vista, California, got down on the tweed seating and panels that incorporate Mexican eagle designs. 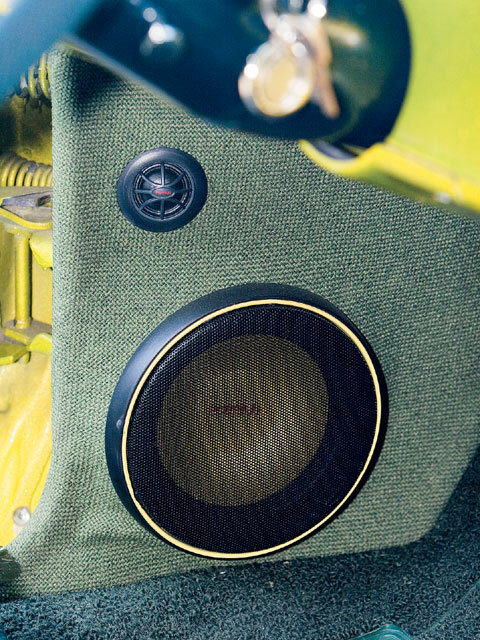 Sound System: Ronnie at Ronnie’s Electronics in National City installed a Pioneer head unit, MTX Thunder amps, and Beyma and JL Audio speakers, plus an iPod player in the center console. Setup: Eric tells us that he has “hydros, of course,” and that the setup by “Lil’ Chaio” at Street Fame in Chula Vista includes a pair of ShowTime pumps, 6-inch (front) and 12-inch (rear) cylinders, four batteries and two switches. The suspension was modified with extended A-arms.